So... who is ready for fall? I know I am! 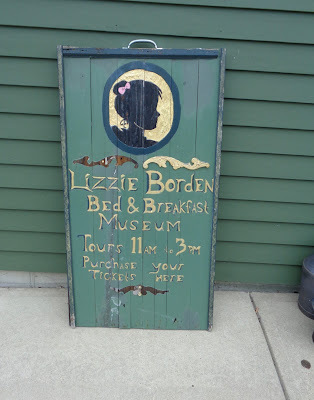 (If I could hibernate during the summer I would, I'm so over summer humidity and heat!) :-p Today I have a sneak peek of colors from SpaRituals upcoming fall collection, Wander. These will be available for pre-order starting: August 1st. All of these polishes have a satin matte finish, so you don't have to use a topcoat with them. But personally, I think the shimmer comes out better when you use a topcoat. (I used Seche Vite). It's your preference really. These polishes are quite pigmented, and go on smoothly. I only needed two coats for each color below. Oasis: Really gorgeous deep dark navy blue. With topcoat the shimmer in this really comes out. 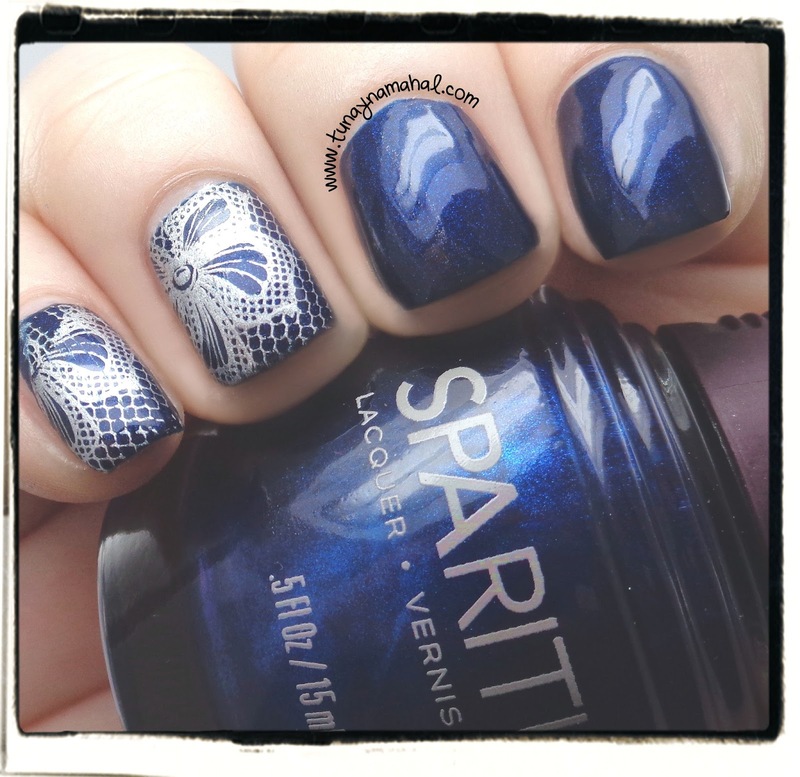 I stamped with Messy Mansion stamp MM44 and Sally Hansen Insta-Dri in Silver Sweep. 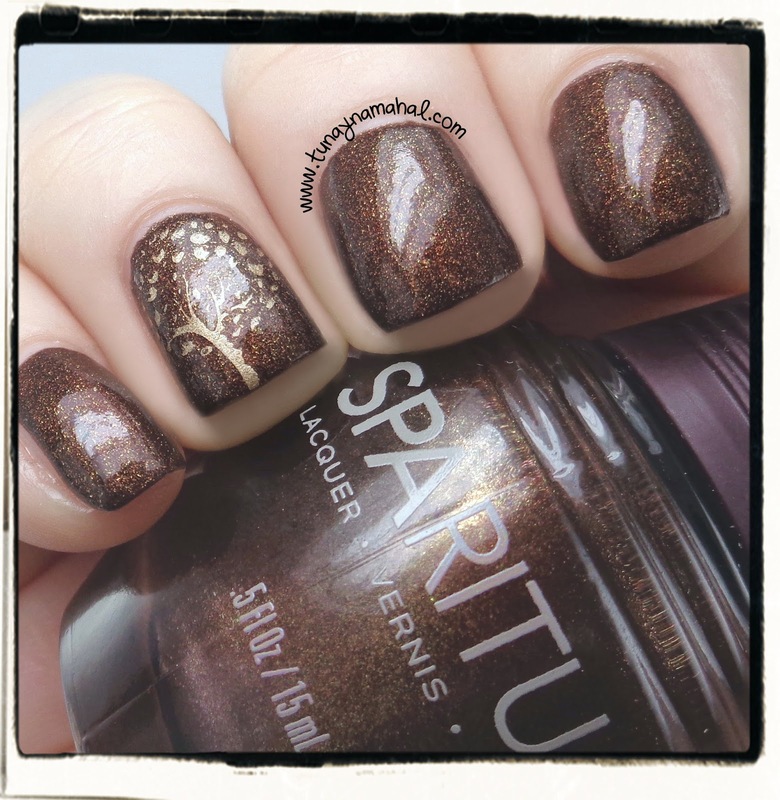 Starry Bright: Such a funny name for a rich brown with gold shimmer. It literally reminds me of coffee, or leaves in the fall. I used Messy Mansion stamp MM19, and Maybelline Bold Gold. 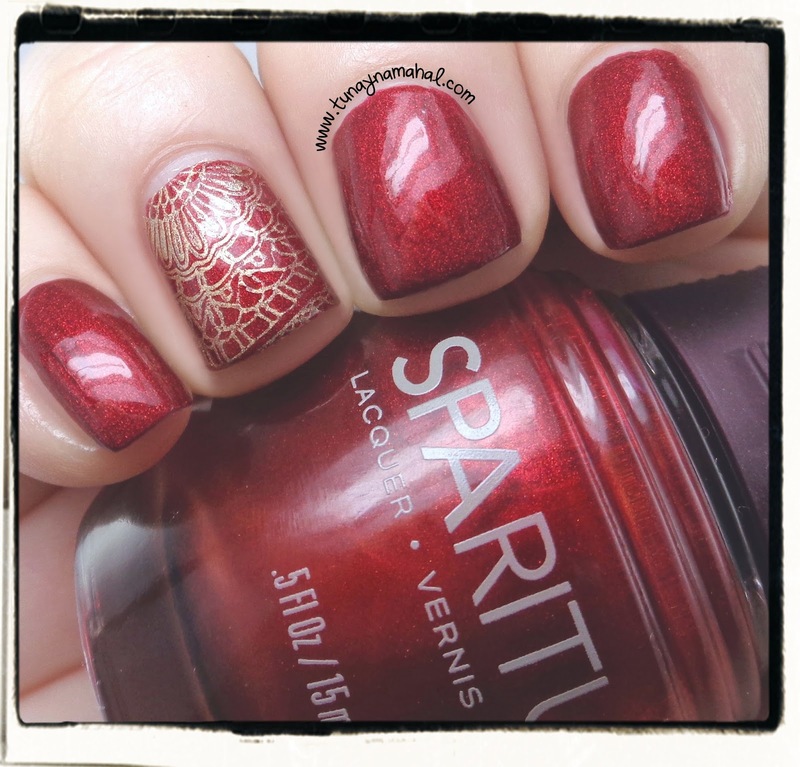 Tapestry: Stunning warm red with shimmer that really pops once you add a topcoat. I also used Messy Mansion stamp plate MM44, and Maybelline Bold Gold. I also wanted to share the results of the SpaRitual Extra Strength Conditioning Lacquer Remover Cloths. You get 6 towelettes for $7. These would be handy for sticking in your purse, or for traveling. I used it on both cream and glitter polish. It does remove cream polish off of all 10 nails before drying out. Glitter... nope. I scrubbed about 4 nails before the cloth dried out. So these work better for regular nail polish, not glitter. 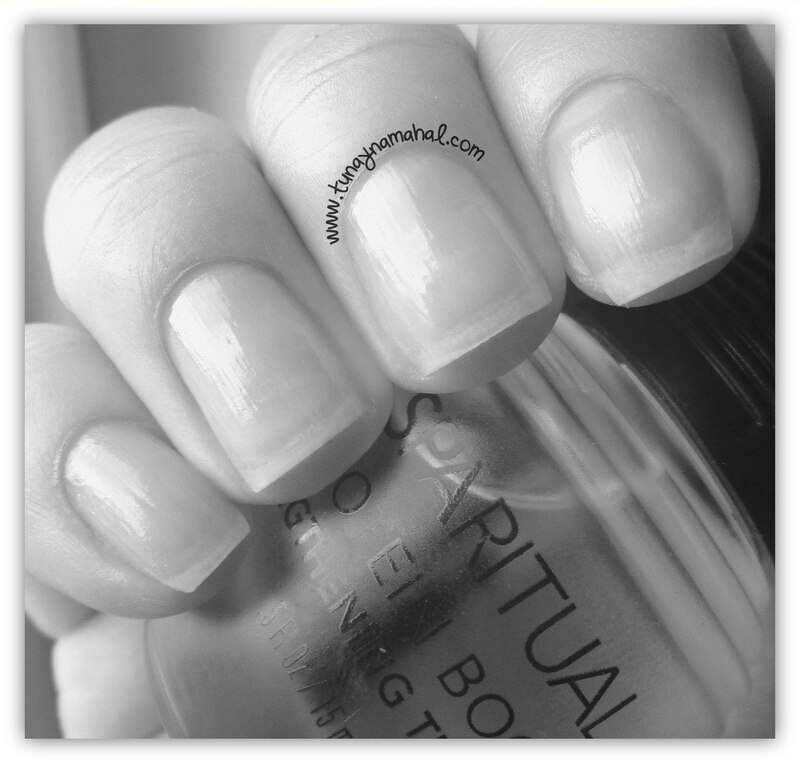 I was also really happy that Sparitual sent me their Protein Boost nail treatment. I usually use OPI Nail Envy Brittle and Dry, and mine was getting low, so I'm happy to try something new. I do get peeling occasionally on the tips of my nails, so I like to use these treatments once in awhile. 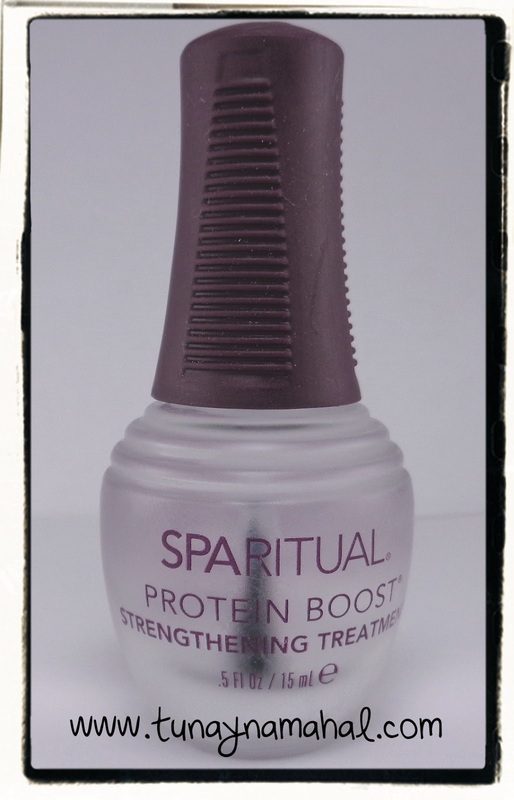 The directions for the Sparitual Protein Boost says to use it for 7 days and then once condition is restored to your nails, to use it every 3-4 days after that. It dries just as quickly as OPI Nail Envy. (I'm not seeing this on their website anymore, but you can still find it on Amazon.com. Buy here: SpaRitual Protein Boost ). You can read more about SpaRitual's philosophy here. We formulate our body care products with vegan ingredients from around the world, including many specially sourced and selected plant essences that are Certified Organic and Fair Trade. Our nail lacquers and nail care essentials are vegan and formulated without DBP, toulene, formaldehyde and formaldehyde resin.